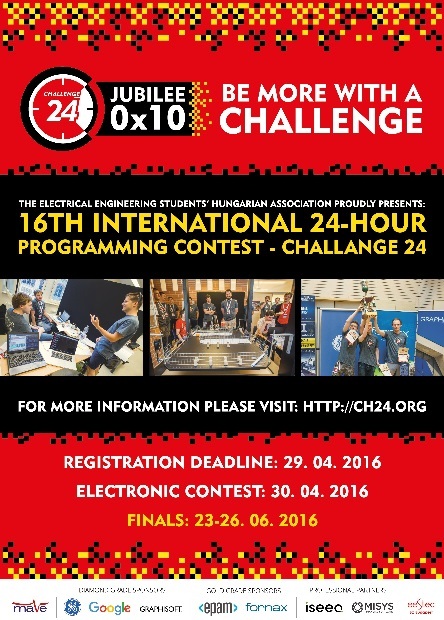 Challenge24, is one of the few team contests where participants are free to choose their tools, platforms and programming languages, and problems are presented only using open file formats. Important !!! Change in evaluation! The submission for the EC is extended until 18:30 CEST. Due to problems with the evaluation framework, your team can submit only one valid solution per task per test case (the lates submitted solution will be evaluated after the submission closes). Thus you won't get feedback until we evaluate your teams solutions which is after the submission ends. If there is any problem with submitting your solutions, send us a mail to info@eestec.hu with your solutions and team name. We will evaluate those which were sent before 18:30CEST. As in previous years, there will be a "demo round" before the EC, called the Pre-EC. This gives you the opportunity to test our submission interface and the evaluation process, and lets us check our infrastructure. You can also use the Pre-EC's problems to practice handling the file formats you may have to deal with during the EC. We think it's highly advisable to try the Pre-EC. The Pre-EC is 6 hours long to accommodate various timezones and schedules, but it doesn't typically require more than a couple of hours to solve the tasks. To upload a solution, you'll have to register a team. Download the problem set BEFORE the contest. IMPORTANT! Due to unforeseen difficulties, this year’s contest’s deadlines changed. We apologise for the inconvenience and hope to see you in the competition! The Pre-EC is 10 hours long to accommodate various timezones and schedules, but it doesn't typically require more than a couple of hours to solve the tasks. The extended registration has started! Be more with a challenge! Congratulation Team Dandelion and Sparrows! Download and share your favourite poster!